Comfortable transport, good organisation by our Tour Leader, who was always willing to help. Good accommodation and excellent itinerary. Seamless service; literature comprehensive and delivered in timely fashion. We had a fabulous holiday and it was amazing to find each National Park different, with a separate special interest; was well organised. All aspects good – no praise too high! As nature’s great playground, the national parks of the southwestern states of America are hard to beat. They offer some of the most beautiful and iconic scenery anywhere in the world and we’re delighted to make their plunging canyons, intricate rock spires, towering, cliffs and sparkling waterfalls the focus of this outstanding walking holiday. Your holiday begins with full and half-day walks in four of the most scenically spectacular parks in the American Southwest: Zion, Bryce, Canyonlands and Arches National Parks. Each offers a striking, otherworldly landscape of multi-hued, sculpted rock formations yet each has a different natural twist, from fairytale hoodoos to delicate rock arches and from vast river-carved gorges to canyons with walls as high as a skyscraper. Heading south into the heartlands of the wild west, we’ve designed this trip to follow in the bootsteps of John Wayne taking you amongst the rock monoliths of Monument Valley and exploring the tribal lands of the Navajo and Hopi Indians in the company of native guides. Following the trail west you’ll next experience the magnificence of the Grand Canyon, walking along the rim trails that offer endless breathtaking vistas, and also down into the canyon itself, giving a stunning, alternative perspective on one of nature’s greatest wonders. You then travel further south through Arizona to laid-back Sedona with its cool, alternative vibe and explore the beautiful red rock scenery on foot. After two days of great hikes through a landscape that is instantly recognisable from a hundred western moves, you return to Las Vegas along route 66 before spending your final night amidst the glitz and glamour of the Vegas Strip. Please note that this walking holiday has replaced our previous Grand Canyon Trek. This is due to restrictions that were introduced in 2019 on trekking into the Grand Canyon at the Havasupai Reservation. Meal arrangements: Breakfast and lunch are provided until departure from Las Vegas after breakfast on Day 15. Fly to Las Vegas. Transfer to hotel. Drive to Zion National Park. Emerald Pools and Observation Point walks. Drive to Bryce Canyon and hike the Fairyland Loop trail. Drive to Moab and walk in Canyonlands National Park. A full day’s walking in Arches National Park. Drive to Canyon de Chelly via a short hike in Monument Valley (optional jeep tour). Day hike with Navajo Guides in Canyon de Chelly. View Spider Rock at sunset. Explore Hopi Mesas en route to the Grand Canyon. Walk along the Bright Angel Trail to Plateau Point. Hike the West Rim Trail of the Grand Canyon. Afternoon at leisure in Tusayan. Drive to Sedona via Flagstaff. Afternoon walk. Walks in Sedona area. Visit Red Rock State Park. Return to Vegas. Overnight flight to the UK. The trip will be led by an experienced driver/guide, ideally placed to give you an insight into, and information about, their country. In tribal lands an additional local guide will join you to further enhance your experience. Today you will fly to Las Vegas in the state of Nevada. On arrival at the airport you will be transferred to your overnight hotel. Flight schedules permitting there may be time tonight to experience the extravagant spectacle of the Vegas Strip. Day 2 - Drive to Zion National Park - 3 hours. Afternoon walk to Emerald Pools – 4.85km/3 miles, 175m/570ft of ascent. You leave Las Vegas after breakfast and drive north to Zion National Park, reached after approximately 3 hours. En route you'll pass out of Nevada and into the State of Utah, home to some of the most spectacular natural scenery in the United States. Named after the homestead of an early settler, Zion is a small but amazingly diverse national park. The multi-coloured rocks of the main canyon complement the colours of the rich vegetation and rushing waters of streams, pools and waterfalls. Mountain lion, golden eagles and a host of smaller 'critters' may be found in the park, which offers some great short and full day walks. After perhaps a look round the informative Visitor Centre, you'll take your first walk of the trip, up away from the valley floor to the Emerald Pools. Passing through a shaded forest of oak, maple and fir you will reach in turn a small waterfall, a hanging garden, and then a series of pools set at different levels on the canyon walls. The trail is well graded throughout and makes for an excellent introduction to the hikes to come. Day 3 - Day walk at Zion National Park to Observation Point – 13km/8 miles and 655m/2,148ft of ascent. The first full day walk of the trip takes you up from the floor of Zion Canyon to the eastern plateau above. The first part of the trail follows a short interpretive trail to Weeping Rock - a rocky alcove with a dripping spring above and overhung with ferns and wildflowers. Relatively few visitors venture past this point as the trail steepens and continues to climb, however it's a good path underfoot, having been cut, pitched and paved in the 1930s. A mile and a half from the trailhead a path forks southwards along Hidden Canyon but you continue northwards to reach Echo Canyon. The steep ascent ends as you enter Echo Canyon, an impressive narrow slot canyon with a sandy floor which you follow a short way, with walls of almost white rock towering above. Ahead, the skyline is dominated by Cable Mountain. The trail leads you away from Echo Canyon and steepens again as you ascend towards the promontory of Mount Baldy, giving all round views. The final ¾ of a mile is over rougher ground but still straightforward, leading you to Observation Point itself. This viewpoint is perhaps one of the best in the park, giving you a sweeping vista of Zion Canyon below, and across to features including Angels' Landing, Cathedral Mountain, the Three Patriarch's and to the south the jagged outcrop known as the Watchman. You return to the valley via the outward route. As with a number of National Parks in the US, a free public shuttle bus service operates within Zion, stopping at all the main trailheads and points of interest. The shuttle reduces the need for visitors to use their cars and thereby cuts down on both congestion and pollution. When you return to the valley floor you can use the shuttle bus to either return to your hotel or, energy permitting, to see some other areas of the park, e.g. The Court of the Patriarchs; a walk along the Virgin River, or the Narrows, a twisting, narrow canyon and one of Zion's most photographed natural features. Day 4 - Drive to Bryce Canyon National Park - 2 hours. Fairyland Loop walk – 14.5km/9 miles and 290m/950ft of ascent. After breakfast you board your transport and make the 85 mile drive east to Bryce Canyon National Park. The first leg of your journey, to Mt Carmel Junction, follows what many consider to be one of the most scenic of all American roads bordered, as it is, by cascades of multi-coloured slick-rock. Along the way you pass through a mile long tunnel, which at the time of its construction in the 1900s was considered an engineering marvel. Also look out for the unusual 'Checkerboard Mesa', a large sandstone outcrop cross-hatched by windblown sand (horizontal grooves) and the effect of freeze-thaw on the natural vertical joints. Although smaller and less well known than parks such as Yosemite, or Yellowstone, Bryce Canyon is a firm favourite with those who have visited; it is often the one people name if asked which park they would most like to return to. Although it boasts a great diversity of flora and fauna (the park covers three climate/vegetation zones and is home to over 100 species of bird, dozens of mammals, and more than a thousand plant species) it is Bryce's 'hoodoos' that make it so unique; a 'hoodoo' being a rock spire formed by the action of ice and rain on the limestone rock which typifies the area. The 'Hoodoos' come in a wide variety of red, pink, yellow and even purple hues, caused by the oxidisation of iron and manganese within the rock itself. The Fairyland Loop trail starts at 2,444m/8,018ft and is a fantastic way to explore Bryce, taking you down 900 feet from the rim, away from the crowds and in touching distance of the colourful hoodoos. The walk can be done in either direction, but most commonly takes the clockwise route. Setting out from Fairyland Point you begin your steady descent into the canyon. The trail rises and falls as you pass through Fairyland Canyon into Campbell Canyon. Eventually you reach the lowest point which is marked by the surprising sight of a hoodoo shaped just like 'Tower Bridge'. From here you slowly climb back to the rim past the striking feature known as the 'Chinese Wall'. Finally, a 2.7 mile walk along the rim trail takes you back to the trailhead. The colours of Bryce Canyon are perhaps best experienced in the late afternoon so, depending upon when you finish your hike, you may well pay a visit to one or more of the park's classic viewpoints, such as Inspiration Point or Sunset point. Once the sun has set you make the short drive to your lodging not far from the park entrance. Day 5 - Drive to Moab - 5-6 hours. Short walk in Canyonlands National Park. Today's road journey is the longest of the entire trip, with around 5-6 hours of driving. As you might imagine there's plenty of scenic interest along the way and your guide will be careful to break up the travelling with rest and refreshment stops. You are now entering cowboy country; Butch Cassidy's boyhood home lies less than 50 miles north of Bryce, and as you travel east the landscape of snow-capped mountains, extensive prairies and red rock canyons will probably look quite familiar from any number of movies. Modern day cowboys still work the land in this region, although you will probably see more in pick-up trucks than on horseback. After passing over the San Rafael Desert you turn off the highway for a short walk in Canyonlands National Park. Carved by the Colorado and Green rivers, Canyonlands' primary features are its spectacular gorges, which naturally create three distinctive areas. The Island in the Sky, where you will walk, lies to the north of the park and overlooks more than 10,000 square miles of rugged wilderness. The Maze District is most readily accessed by raft/boat along the Green River a method used by the region's foremost explorer John Wesley-Powell in the mid-19th century. The Needles District in the Park's south-east corner features a range of multi-coloured rock spires similar in appearance to those seen at Bryce. Depending on the time taken to reach Canyonlands, there should be time to walk along either or both the Grand View Trail (2 miles), or the Upheaval Dome Overlook Trail (1 mile). After your leg stretch, it's around a 30 mile drive to reach your base for the next two nights at Moab. The town of Moab is Utah's self-styled adventure capital. Long the home of Sabuagana Ute Indians, the first permanent settlement here was made by Mormon farmers between 1878 and 1879. Today the area remains a rich producer of peaches, apples and grapes. In the 1950s Moab boomed with the development of Uranium mines, followed by the discovery of oil and the extraction of Potash in the 1960s. With the decline of these industries in the late 1960s, tourism has become Moab's most high profile industry. The fabulous natural scenery draws visitors from across the USA and beyond: the former mining roads are popular with off-road drivers, the rivers offer exhilarating white water rafting, while the slick-rock presents challenging routes for rock climbers and mountain bikers alike. Moab has a relaxed atmosphere and a good selection of shops, cafes, bars and restaurants. After checking in to your hotel and freshening up it's just a short walk to find a pleasant spot for a cool drink and dinner. Day 6 - Walks in Arches National Park, including Devil’s Garden - 11.6km/7.2miles, approximately 15m/50ft of ascent, and Delicate Arch – 4.8km/3 miles and 146m/480ft of ascent. Just five miles north of Moab is Arches National Park, boasting over 2,000 natural rock arches. The park lies above a bed of salt, which was deposited on the Colorado Plateau around 300 million years ago following the evaporation of a former sea. Subsequent centuries saw this salt bed overlain with a variety of deposits which became compressed into layers of rock. Eventually, the pressure of this overlying rock caused the salt layer to shift and buckle, leading in turn to a series of up-thrusts and subsidence. Relatively recently, in geological terms, this landscape has become scoured by natural forces such as wind, ice, water and heat to create an area of spires, arches, sandstone fins and steep buttresses. Today you will take a series of short walks, taking you to some of Arches most famous features, such as Balanced Rock, the Windows and Double Arch. You will also take two longer hikes. From the northern end of the Park you trek into Devil's Garden, which contains the dramatic Landscape Arch. With its span of over 60ft, this arch is evidence of the continuing processes of erosion. In 1995 two large sections of rock fell away from the Arch, making it even more slender and sinuous. Most visitors to Devil's Garden head straight back to the trailhead from this point but you will pick up a 'primitive' trail which leads you deeper into the back country. Although mainly a sandy path, this trail also leads you up, over and along a number of the sandstone fins. Your ultimate goal is Double O Arch, offering some great photo opportunities. Your second hike today will take you to the state symbol for Utah - 'Delicate Arch'. The route is almost entirely over bare rock and involves a gradual ascent from a stream bed up onto a broad sandstone dome. Although the walk entails a relatively modest ascent it can be tough going in the heat of the day, so your guide will probably start, or end the day with this hike. The final section of the walk involves a short stretch of approximately 350m/1,200ft, along a ledge path cut into the rock. This path slopes into the rock you're traversing and is a good 3-4ft wide throughout, so really presents no problem. The arch itself is hidden until the last moment you arrive just above the rocky bowl in which it stands. Day 7 - Drive to Monument Valley. Short walk – 5.15km/3.2miles, negligible ascent. Drive to Canyon de Chelly National Monument - 2 hours. You make an early start today for the journey to Canyon de Chelly. Non-stop this road trip would probably take you around four hours, but along the way is one of North America's 'must see' sights; the iconic Monument Valley. Belonging to the Navajo Nation, Monument Valley covers an area of nearly 100,000 acres and straddles the Utah and Arizona boundary. In 1938 the beauty and drama of the freestanding rock spires, buttes and mesas drew film-maker John Ford here and 'Stagecoach' became the first of countless movies made here since. It is a couple of hours drive to reach Monument Valley where you will be able to stretch your legs on the 'Wild Cat Trail', a short three mile walk out to one of the most prominent features of the valley, the East Mitten. For those that wish, an optional 4WD excursion around the main attractions of the valley is possible instead of the walk (payable locally - prices start from around $75 per person). You are now in the heart of Native American Indian territory and as you drive south you pass a mixture of isolated homesteads and small settlements. Altogether the Navajo Reservation has a population of around 90,000, whilst the smaller, neighbouring Hopi Reservation stands at around 11,000. Today tourism is an important part of the local economy with traditional crafts such as weaving and jewellery-making much in evidence. Traditional values and beliefs also remain strongly held, many enshrined in tribal law. Alcohol is prohibited on Navajo and Hopi lands (including in restaurants and hotels) and permission should always be sought before attempting to take photographs of people or their homes. The Visitor Centre in Monument Valley features regular exhibitions of Navajo life, art and history. Leaving Monument Valley you drive south through the Arizona desert for a couple more hours to arrive at the small town of Chinle. Here you check into your hotel for the next two nights, close to the entrance to Canyon de Chelly National Monument. Day 8 - Canyon de Chelly hike - 16-19km/10-12miles, approximately 305m/1,000ft of descent. Scenic drive along canyon rim. The labyrinth-like Canyon de Chelly (pronounced 'shay') is actually formed of several canyons which extend from the outskirts of Chinle. At the mouth of the canyon the rock walls stand some 30 feet high but as you head east into the main canyon, these walls become 1,000 foot high towering cliffs. Archaeologists have established that this area has been continuously inhabited for around 5,000 years and the canyon is one of the most important ancient sites in the US. The original settlers here were hunter gatherers who camped on the canyon floor but over time the natural caves and ledges of the canyon became the preferred places for dwellings, offering natural shelter and protection. In the last 2,000 years Pueblan Indians have been succeeded by Hopi and then Navajo tribes. Today the canyon floor is still farmed by a few Navajo families, some living in hogans - a traditional, octagonal dwelling made of timber. Alfalfa, corn and fruit are grown in the fertile soil and sheep are grazed in the shade of the canyon walls. Today you make an exploration of Canyon de Chelly on foot, in the company of a local Navajo guide. Apart from one very short trail to a view point on the canyon rim, there are no way-marked trails in Canyon de Chelly. Your Navajo guide will therefore take you on a route used primarily by canyon dwellers over many, many centuries. Over the first hour or so you can expect to be walking upon the bare sandstone rock - following the natural curves of the rock and dried up water courses. In places you'll descend steps, cut by the Navajo, and reach vantage points that reveal some of the well camouflaged cliff dwellings. Upon reaching the sandy canyon floor your guide will take you to see further cliff dwellings and occasional petroglyphs of animals and people, telling the story of day to day life in times past. The chances are your guide will have lived in the canyon at some point in his life and along the way you'll be able to find out more from him about Navajo life, past and present. Your walk will end at the visitor centre, at the mouth of the canyon, after around five hours of walking. There is an interesting interpretive display, film and bookshop here. Before returning to your hotel you will make the return drive along the south rim of the canyon, to Spider Rock Overlook. There are a couple of scenic viewpoints along the way, which are well worth taking in as the sun begins to set. Spider Rock is an 800 foot sandstone spire that stands proud of the canyon floor at the junction of Monument Canyon and Canyon de Chelly itself. Day 9 - Drive to First Hopi Mesa – 1½ hours. Explore Hopi Mesas and museum. Drive to Grand Canyon - 3 hours. Your discovery of Native American heritage and culture continues today as you head west through the Hopi Reservation. The Hopi is Arizona's oldest tribe, first arriving in the region around 1,200 AD and making their home on three mesas (hill tops) which they have been continuously inhabited ever since. Known for their strong religious beliefs, many Hopi still observe a cycle of ceremonies which follow the lunar calendar including the Spring Bean Planting Ceremony and the Home Dance Ceremony of the summer. A couple of hours drive from Chinle brings you to First Mesa and the small villages of Sichomovi and neighbouring Walpi, which is thought to be the oldest of all the Hopi settlements. In the village hall of Sichomovi, you'll meet a local Hopi resident and together make a walking tour of Walpi. Few Hopi live in Walpi all year round now - the village perches quite precariously some 300 feet above the valley floor and is without running water, but one or two hardy souls remain. A number of ceremonial kivas are carefully maintained and some of the older homes are now being renovated for seasonal use. As well as learning about the life and traditions of the Hopi people you'll doubtless have the chance to purchase some of the traditional handicrafts, including carved Kachina dolls, which represent the life giving spirits revered by the Hopi. A short drive on from Walpi brings you to Second Mesa. You will probably have lunch here and then visit the Hopi Cultural Centre which houses a small museum. From Second Mesa it's around a three hour drive west, crossing the Little Colorado River to reach the eastern entrance to Grand Canyon National Park, at Desert View. The first sight of the Grand Canyon is one likely never forgotten. The travel writer Pete McCarthy once declared it the one place on the planet that actually managed not just to live up to all of the associated hyperbole, but to actually exceed it. The scale of the canyon is simply immense. Over a mile deep, 10 or more miles across and 227 river miles long. There is a watchtower at Desert View from which you will be able to take in your first view of the canyon and capture the first of no doubt countless photographs. From Desert View the road follows the south rim of the Canyon, with occasional lay-bys, offering further views into the canyon. Just before Grand Canyon Village which has a collection of visitor services including bookshops, gift shops etc, you turn south to reach the small town of Tusayan, at the south entrance to the National Park. Tusayan is the main lodging area serving the Grand Canyon with a range of hotels and restaurants for visitors. It's just a stone's throw from the park entrance and less than 10 minutes' drive from the south rim itself. Day 10 - Grand canyon National Park. Day walk to Plateau Point 19.7km/12.4miles, 951m/3,120ft of ascent and descent. During sunrise and sunset, when the canyon walls take on fantastic rich, deep hues of red and gold, are the best times to view the canyon. So this morning, for those that wish, the day begins with a sunrise viewing. One advantage of sg the sun rise over the canyon is the clarity of the views. Daytime temperatures rise so the longer distance views can become obscured by haze and air pollution. In order to play their part in reducing air pollution the National Park Service operate a shuttle bus service to help limit the number of cars on the rim-side roads. Although you will use your usual transport to enter and leave the park during your stay it is likely that you will use the park shuttle service to get to and from the trailheads. Today you take a guided walk down into the canyon, along one of the most celebrated paths; The Bright Angel Trail, named after the geological fault it follows through the limestone cliffs. Few visitors who visit the canyon ever actually descend below the rim and even those who do often don't tread more than a short distance. Certainly, once you have passed the first of two rest-houses (toilet blocks) on this trail, you are likely to be well away from any crowds. The first part of the walk takes you steeply down on a series of tight zigzags. The path is good, but stony underfoot and you may need to occasionally keep to one side (the uphill/cliff side) to allow the mules that take supplies and visitors in and out of the canyon, to pass. After around 6 miles of walking and a descent of another series of zigzags known as “Jacob's Ladder”, the trail becomes less steep and you reach a broad plateau - formed from the curiously named Tonto strata of rock. A further mile and a half then brings you to a welcome shaded 'oasis', Indian Garden. The spring here was used by the Havasupai Indians who once farmed this area, although the cottonwood trees were specifically planted to offer visitors shade in the early 1900s. If you wish you can rest at Indian Garden whilst the more energetic continue on for a further one and a half miles to reach Plateau Point, a viewpoint overlooking the Colorado River, a further 1,400ft below. The rule of thumb, promoted by the National Park, is that walkers should expect it to take twice as long to hike up out of the canyon, as it does to hike down. Although keen walkers might find this quite a conservative estimate, it is an ascent of over 3,000ft to regain the crest of the south rim from Plateau Point so it's important to allow plenty of time for the hike out. Before heading back to your hotel for the night, there should be time to pay a visit to Kolb Studio, located near the Bright Angel trail head. The Kolb brothers, Emery and Ellsworth, built their home, photographic studio and laboratory, right on the canyon edge in 1904. In 1912 the brothers found fame by making the first cine-film of a descent of the Colorado River through the Grand Canyon, rapids and all. Emery Kolb showed the movie at the studio every day from 1915 until his death in 1976. Today the studio houses a bookshop and a rolling programme of photographic exhibitions. 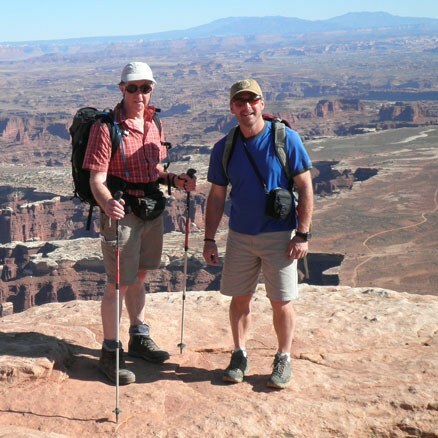 Day 11 - Walk along the West Rim Trail of the Grand Canyon - up to 8 miles/12.9km, negligible ascent/descent). Afternoon at leisure in Tusayan . This morning there's a further opportunity to watch the sun rise from the South Rim and then time to hike along the west rim of the canyon. From Grand Canyon Village the eight mile 'West Rim Trail' leads along the canyon edge to Hermit's Rest, taking in four major viewpoints along the way: Maricopa Point, Hopi Point, Mohave Point and Pima Point. Each of these viewing areas offers superb vistas of the canyon but the best is saved 'till last, with Hermit's Rest offering what many consider the finest of all views in the Park. The small stone building at Hermit's Rest was built by renowned local architect Mary Elizabeth Jane Colter in 1914, as a rest stop for stagecoach passengers taking tours along the West Rim. Colter was responsible for the design of a number of the Grand Canyon's landmark buildings, including the Watchtower seen when you entered the Park, and the Bright Angel Hotel. You return to Grand Canyon Village using the shuttle bus. There will be some free time and you will be able to visit the Grand Canyon visitor centre. You will then return to your lodge at Tusayan and the afternoon is free for you to perhaps do a bit of shopping or visit the Imax theatre for a stunning look at the Grand Canyon on the big screen. The Grand Canyon airstrip is located just outside Tusayan and it is possible to arrange an overflight of the Grand Canyon from here. This would be payable locally and if you speak to your guide earlier in the tour he will help to get this arranged. Day 12 - Drive to Sedona - 2 hours. Walk Bell Rock and Courthouse Butte loop - 4½ miles. This morning you leave the Grand Canyon behind and make the 100 mile drive south to Sedona. On the way you will stop off in the attractive college town of Flagstaff for a coffee break. Continuing to Sedona you enjoy a scenic drive through a narrow canyon with vertical walls, verdant green trees and even a babbling brook. The scenery may look quite familiar in places as this area was used as a backdrop for many westerns and you can easily imagine a posse of cowboys or outlaws riding out across the red desert sands. Upon arrival you will drop your bags off at your hotel and drive to the trailhead for today's walk around the Courthouse Butte. Bell Rock and Courthouse Butte are two prominent sandstone peaks at the south edge of Sedona's red rock formations. The loop has good views of both buttes from all directions, and of higher cliffs to the north, while encountering varying terrain of rocky terraces, dry washes, light woodland and flower-filled grassland. After your walk you return to your hotel and there will be time to take a dip in the inviting pool or just relax on the sun terraces. Day 13 - Oak Creek Walk - 6.4 miles. Time at leisure in Sedona. Today you will walk the best trail in the Sedona area, along the lower end of the west fork of Oak Creek. The route follows a stream that flows through a deep, forested canyon which is quite narrow in places, with many pretty eroded rock formations and plentiful wildlife. Along the way you will pass through the site of a ruined settlement, with overgrown remnants of fireplaces and stone floors still visible. There is also an unusual cliff house; all structures are part of the early 20th century dwelling of Mayhew Lodge, long since abandoned. The canyon is hundreds of feet deep and moderately narrow from the start; wooded, overgrown and shaded with many fallen trees and old logs, often lying in the stream. The path crosses the creek many times. Wildlife is plentiful with many colourful birds and butterflies, squirrels and lizards to look out for along the way. Red is the dominant rock colour - most of the cliffs are of reddish-orange Coconino sandstone, with white Kaibab limestone much higher up. The sandstone rocks are multi-layered, often eroded into many curving shapes and with frequent short, tunnel-like passages, similar to the famous Subway of Zion National Park. Occasionally the creek has pools 3-4 feet deep which harbour trout and other fish. The stream flows gently, and the hike is beautiful and relaxing. After your walk, the day is yours to enjoy the many shops, galleries, cafes and bars of Sedona before returning to your hotel. Day 14 - Morning visit to Red Rock State Park with optional nature walk. Drive to Las Vegas - 4 hours. This morning you will visit Red Rock State park a 286 acre nature preserve and environmental education centre with gorgeous scenery. Trails wind through manzanita and juniper to reach the rich banks of Oak Creek, whilst verdant meadows are framed by native vegetation and hills of red rock. A pretty creek meanders through the park, creating a diverse riparian habitat abounding with plants and wildlife. You will have the option of joining the guided nature walk that departs at 9am from the visitor centre or you can explore the network of trails that leave from the visitor centre. The property was acquired by the Arizona State Parks Board in 1986 and the park was opened to the public in 1991. The land was at one time part of the Smoke Trail Ranch, owned by Jack and Helen Frye. September is a great time to visit this park as this is the time the Monarch butterflies undergo a rigorous, long-range migration to their overwintering sites in Mexico and California. Late September is the time they typically move through the state and hopefully a large number will pass through Red Rock State Park. After your visit you make the return journey to Las Vegas which will feel a complete culture shock after your time spent amidst the many natural wonders of the region. However, a visit to the Strip is an experience not to be missed. Since the 1980s, hotel and casino companies have been engaged in an increasingly garish and outrageous game of 'anything you can do we can do better.' In addition to the Pyramid and Sphinx of the Luxor Hotel, there's the mini city-scape of New York New York (complete with Statue of Liberty) along the road there's the Paris Hotel, the opulent Bellagio, celebrated Caesar's Palace and across the street the Venetian - complete with gondolas to deliver you from the pavement to check in or the ubiquitous shopping mall. When the sun goes down the entire strip is a cascade of neon and laser light shows, and there are numerous musicals, shows and glitzy restaurants to give you a final night to remember. Day 15 - Time at leisure. Group transfer to airport for flight to London. Flight schedule permitting there may be time this morning for some souvenir shopping and a further wander along the Strip, before transferring to Las Vegas airport for your return flight to the UK.